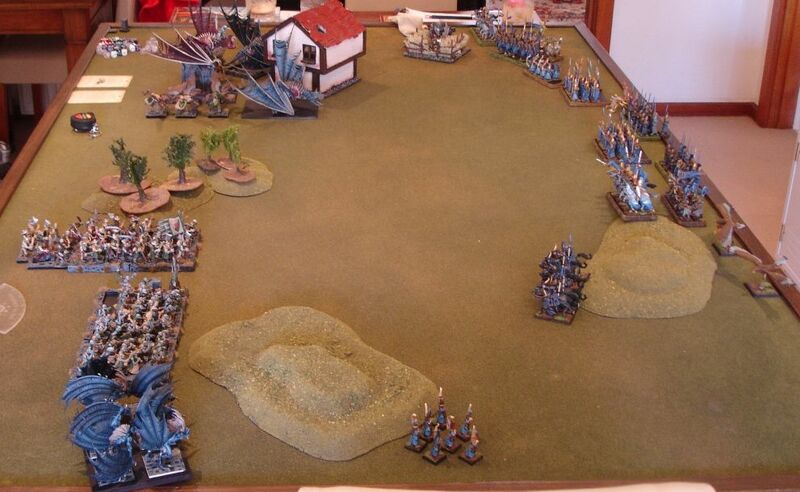 I had a very nice opportunity to test my army under new rules against Vampire Counts led by my good friend Adam. Adam wanted a practice game before one-day tournament (which I sadly could not attend) and I was more than happy to be his sparring partner. He didn't make it an easy task for me either as he decided to use quite a tough army. Big fliers are very tough opponent for my small units, especially infantry. Terrorgheists are even better at eliminating the small cavalry units with their screaming attacks. What is worse, they can charge and scream into combat too. One is a tough nut to crack and I had to face 3 of them, where one was mounted by a Ghould King himself. Pretty good combat monster if you ask me. He was not equipped to take after some well armored enemies but his strength combined with hatred and very high initiative meant any unit he decided to attack can be potentially destroyed in a single round. 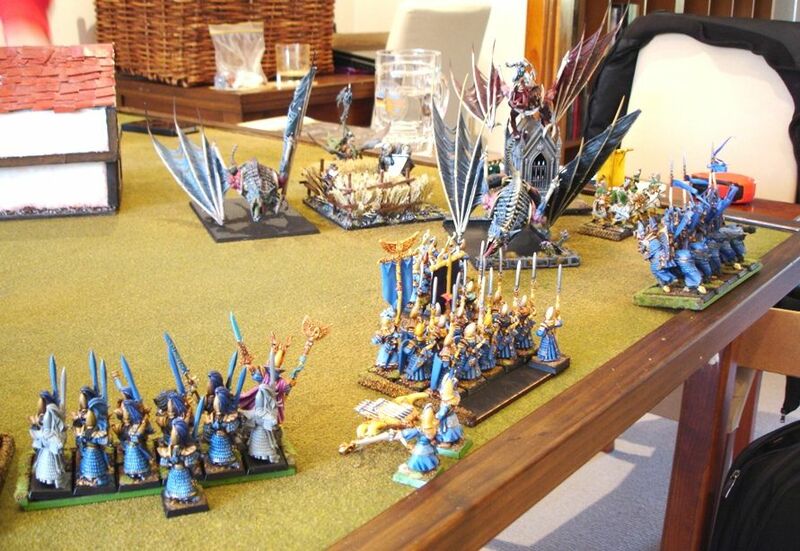 The reason for that is simple, his attacks + terrorgheist's scream + its attacks + thunderstomp = lots of dead elves. If the infernal trio was not enough there was also BSB who was very good at combat, big enough unit of vargheists that could destroy my small units on their own too and two huge infantry regiments. Very hard to destroy, especially with all these flying monsters around. In theory the magic was not that strong. However, 3 casters, all taking invocation and 2 bound spells meant that I was looking at a very difficult situation where any wounds on terrorgheists or characters can be healed in no time. I haven't had a success against similar armies so far. I had one memorable encounter against another friend of mine, Gatti, who with a similar army really beat me to a bloody pulp. 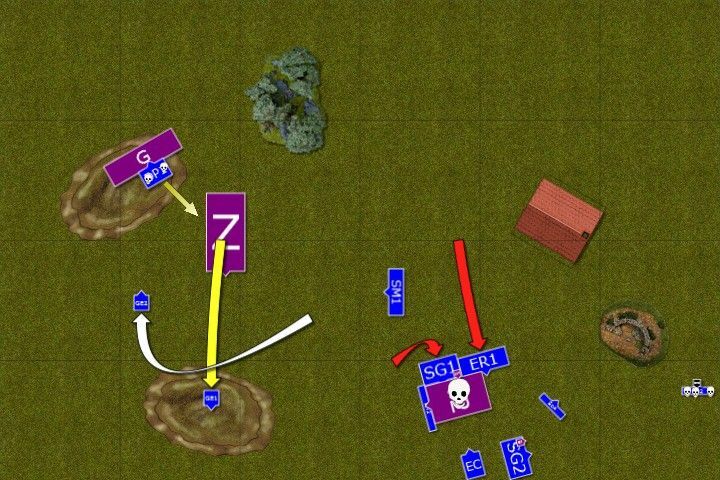 Remembering the lessons from that game I decided to deploy further away (almost at the ending edge) trying to ensure units were in close proximity to each other. I wanted to try to harm Terrorgheists as much as possible so that their screaming attacks were less dangerous and seek opportunities to attack them and destroy them in combat. At the same time I decided to slow down infantry hordes with either eagles or other fast elements. I planned to play a different game than usual. 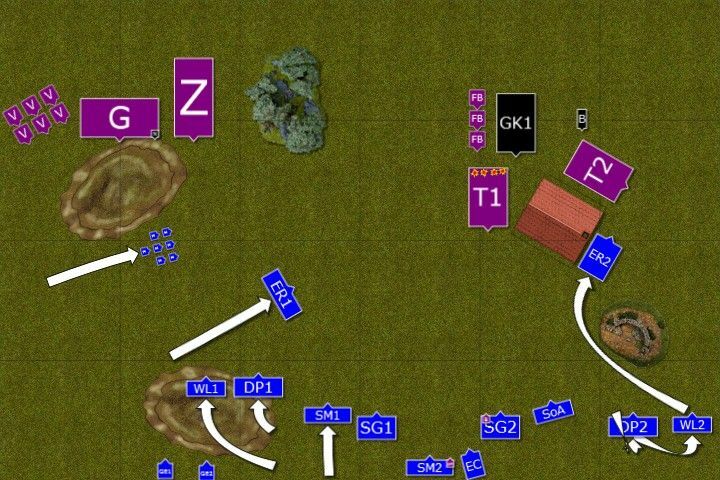 Instead of sweeping maneuvers I wanted to bid my time, keep close formation and shoot at the enemy, at the same time denying easy combats if possible. As the deployment is often so crucial to the games I wanted to come up with some plan to do it well this time. 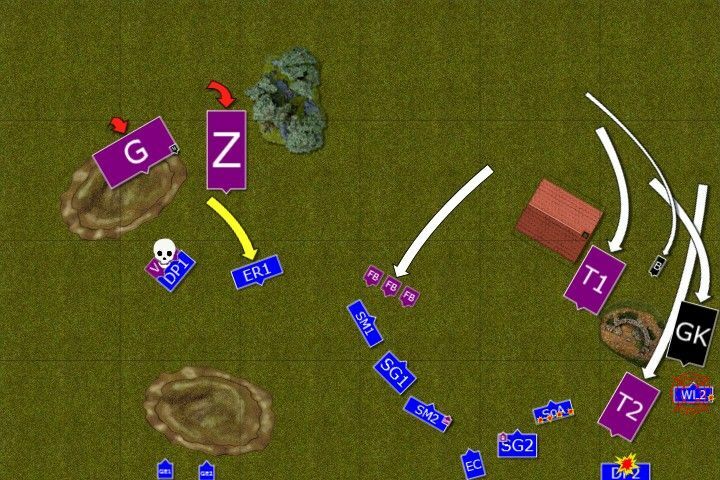 I won the roll off to pick the side and decided the one with the hill in the deployment zone would be better for obvious reasons. But I had two things to consider. First, I knew that the longer I postpone the combats the better the chances to actually destroy all these nasty fliers. Second, my opponent would probably want to use that big building to hide his beasts from some of my shooters. 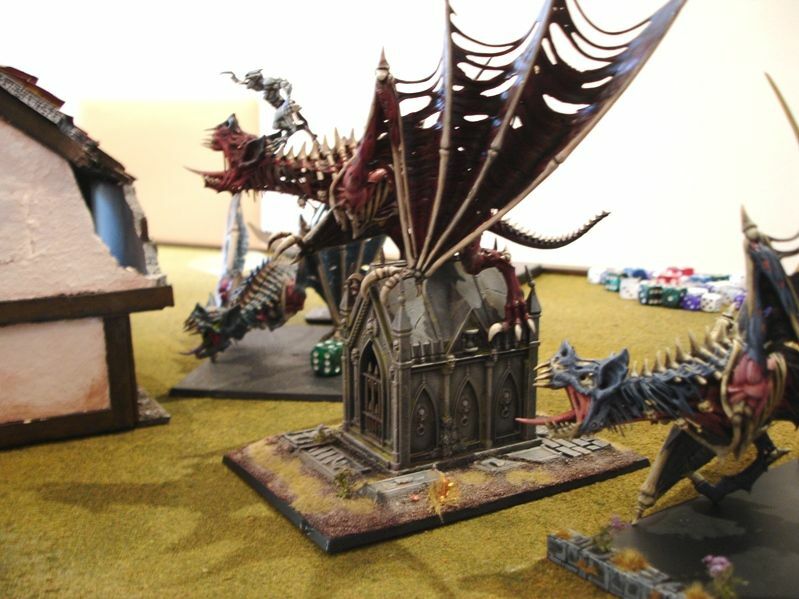 We also agreed that despite the fact the King and his pet were mounted on a small building that made him "taller" than regular terrorgheist he would still be hidden behind one of his other beasts. With more drops I could see where Adam was about to position his minions and I wanted to use that knowledge to deploy relatively diagonally. If he opted to go for the right flank, I could deploy around the hill. 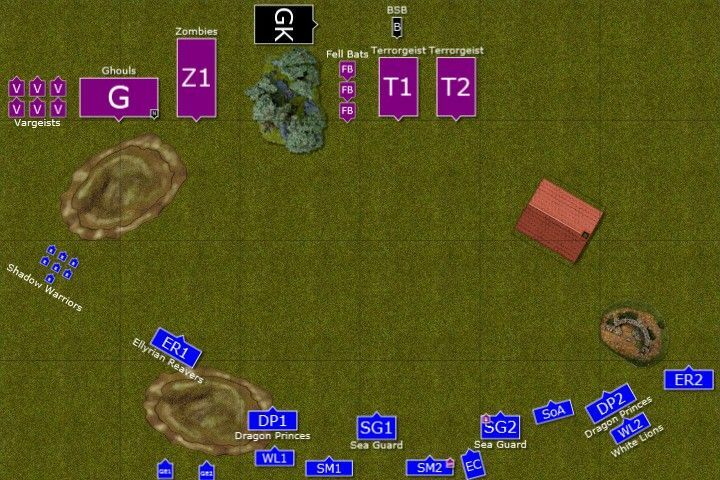 When he chose the the left flank, I could deploy my forces center and right to put more distance between our armies. Adam had a very good redundancy in his magic phase and backed up by bound spells that phase of the game might be difficult to contain. I was happy with my own spells selection as I had something for different occasion. Searing Doom was obviously there to help me hunt down the BSB. Enchanted Blades would be cast either on Eagle Claw to help to hit with these single shots and in combat on Swordmasters so they could hit on 2+ (who needs re-rolls anyway!). Final Transmutation would be handy against Ghoul Horde too. Ghoul King ordered his pets to fly with him behind the relative safety of the nearby building. Knowing they would still be too far away to scream at the Elves, he didn't want to risk being a target for enemy shooters. 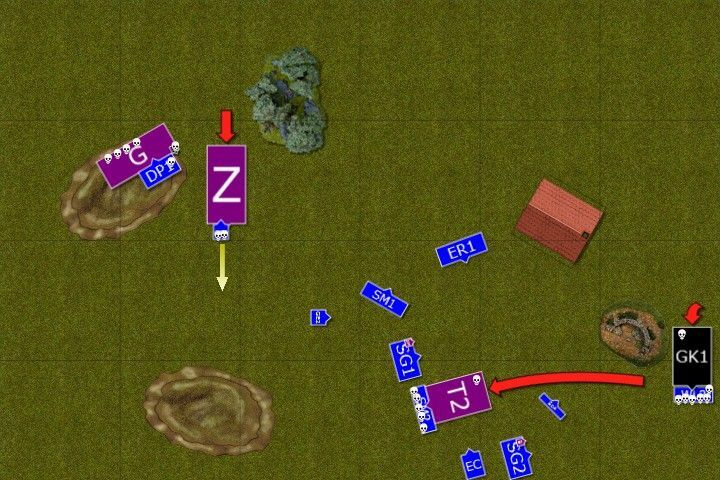 But that maneuver meant his infantry was left behind and moved at a very slow pace. Only fast units move ... fast! Shadow Warriors run behind the hill knowing the flying vargheists would see them anyway but hoped they would draw their attention and bring forward towards White Lions and Dragon Princes waiting to intercept. Other units readjusted their positions but in general the army maintained the formation. Then the shooters opened fire at the terrorgheist left in the open and badly wounded the beat. Unfortunately it was still alive and limped away to be healed by its master. 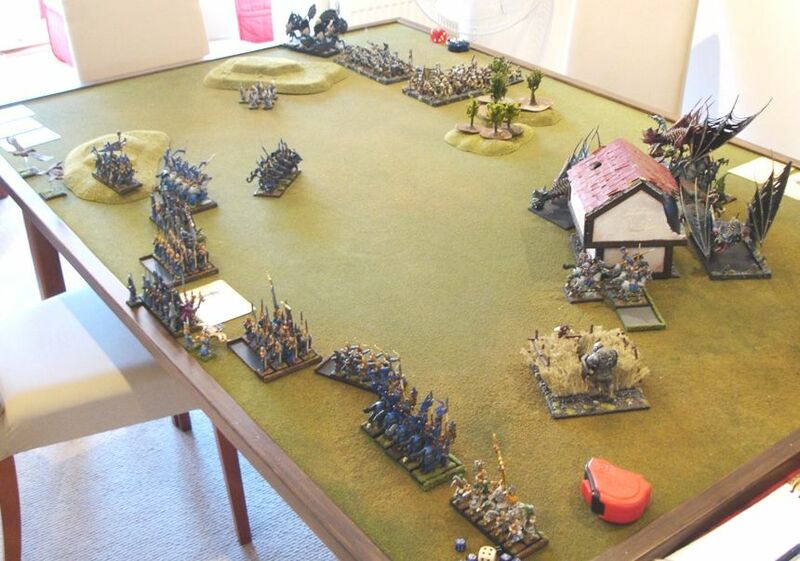 On the left flank Ghouls attacked Shadow Warriors but were soon left behind by charging Vargheists. Elven rangers retreated but were not swift enough to avoid their pursuers, who now sit very close to White Lions and Dragon Princes. On the right flank undead fliers moved further to the side of the battle field. This time terrorgheists screamed at reavers and all brave ellyrians fell to the ground. Evil necromantic magic started to repair the damage elven arrows did to the terrorgheist. 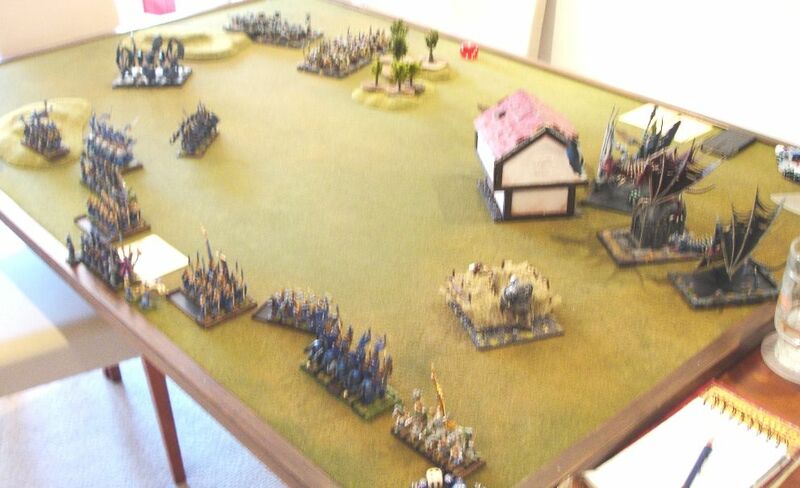 Seeing the opportunity to destroy enemy unit and slow down the infantry, elves attack on the left flank. 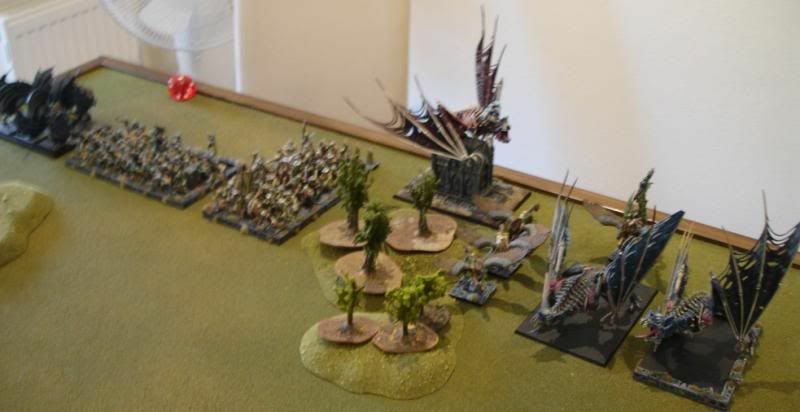 Dragon Princes and White Lions both charge as one. No less than 4 of the evil vargheists are destroyed as a result of a vicious combat. But the price is high and none of the Lions survives it either. Dragon Princes were determined, however, to finish them once and for all and avenge the fallen companions. On the right flank intervening impassable terrain made it impossible for another group of lions and princes to perform preemptive strike. 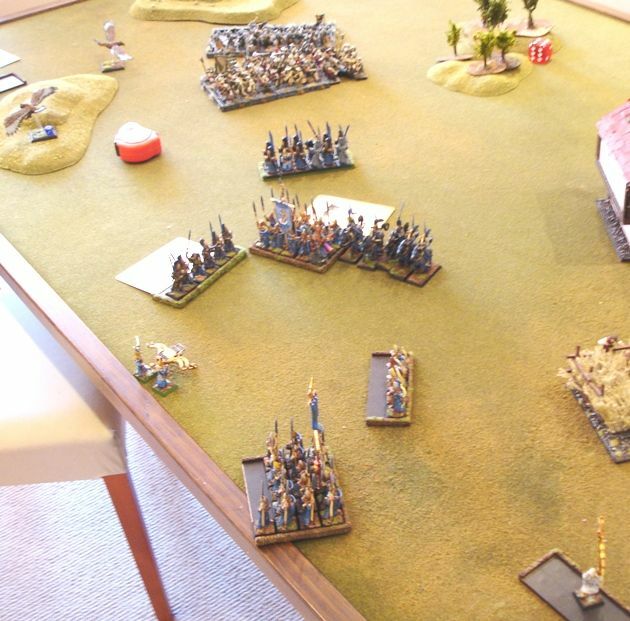 Cavalry withdrew and lions moved a little bit forward to be able to attack soon. The rest of the army formed a crescent and unleashed their arrows again. This time ghoul king himself became the target and although he suffered only a flesh wound his mount barely kept itself together. One more arrow and it would be dead for good. Closing in for a a kill! Crucial moment of the battle! 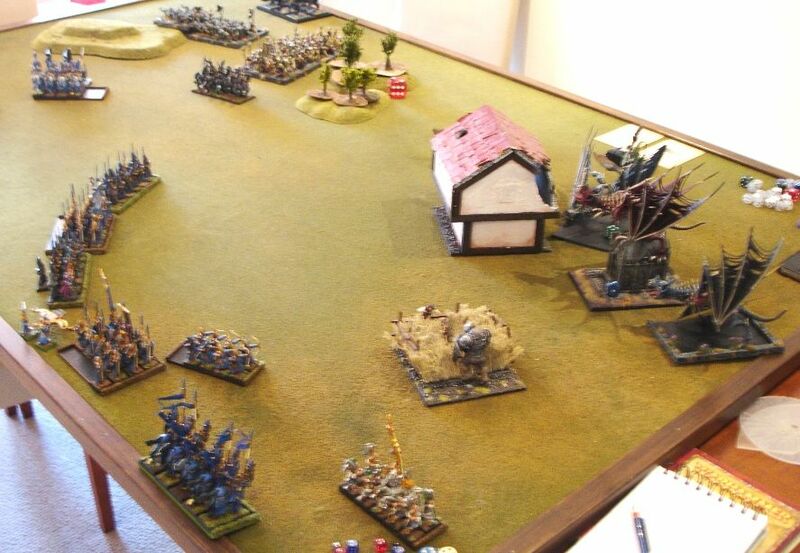 Dragon Princes on the left flank managed to destroy remaining vargheists and reformed to face a new target. Ghouls and Zombies tried to catch swift reavers but it was nigh impossible. On the right flank Ghoul King decided on the risky maneuver. He ordered his monsters to get as close to the elves as possible so that they would have nowhere to withdraw. But he first had to heal his pets and survive incoming arrows. His plans were destroyed by the archmage who dispelled his and bsb's attempts to heal the terrorgheists. Only Lions suffered single casualty from the evil spell hidden in magical item carried by the king. That was bad news for the undead as their wounded monsters were now all in the open. The only good part was that one of the terrorgheists destroyed whole squadron of the heavy cavalry with its powerful scream. Victorious Dragon Princes on the left flank charged into the ghoul horde in order to hunt down the necromancer. They wounded him once but could not finish him yet. 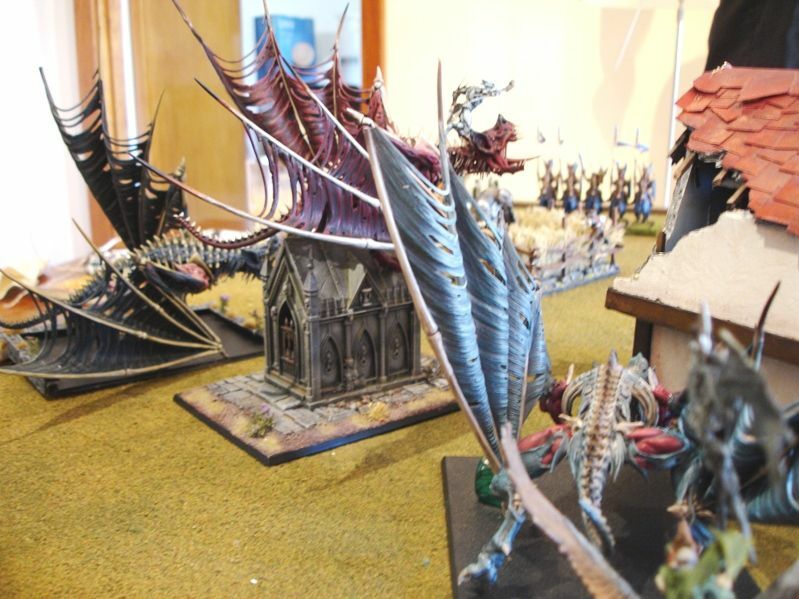 More ghouls were destroyed and dragon princes were now surrounded by evil corpse eaters. 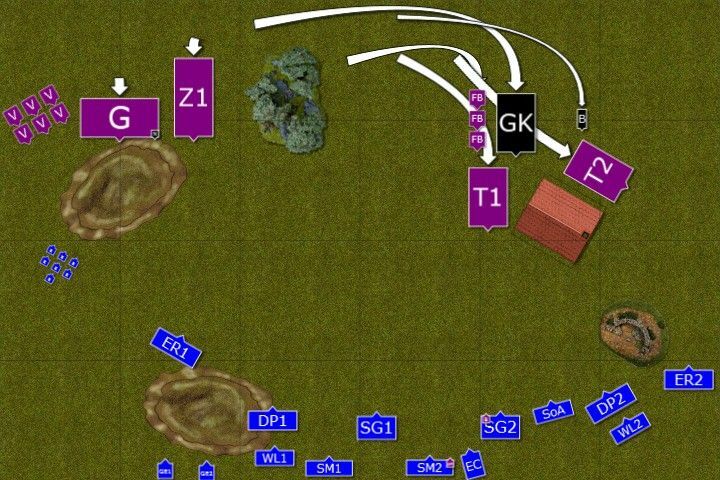 But the main strike was done on the right flank. Winds of magic blew weak so elven archmage summoned his powers to cast a single spell. None of the vampires could stop him and from the armored form of vampire battle standard bearer only a smoking husk remained. Encouraged by such a feat all the shooters aimed at the wounded terrorgheist and destroyed it for good this time. 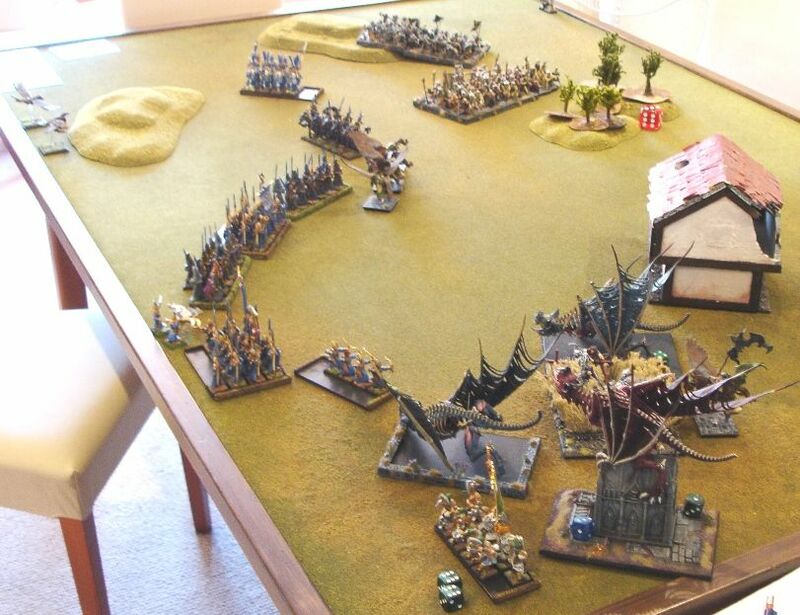 Although two more and the ghoul king still remained it was a very powerful strike and significantly reduced the offensive power of the vampire army. Dragon Princes, now completely alone, fought valiantly and finally got the necromancer. More ghouls crumbled to dust too. Ghoul King decided to attack White Lions all by himself. His hatred led his powerful arm and more than half of a unit perished. But remaining Lions stubbornly held the line and dealt the final blow to the badly wounded terrorgheist. The last of the beasts charged thin line of the warriors of Hoeth. Many of them died and they focused on defense so the monster was not wounded badly. But enough of them held to hold the line and now they could join the forces with nearby sea guard. On the left flank dragon princes were finally overwhelmed by the ghouls but held them for long enough to prevent any further trouble. 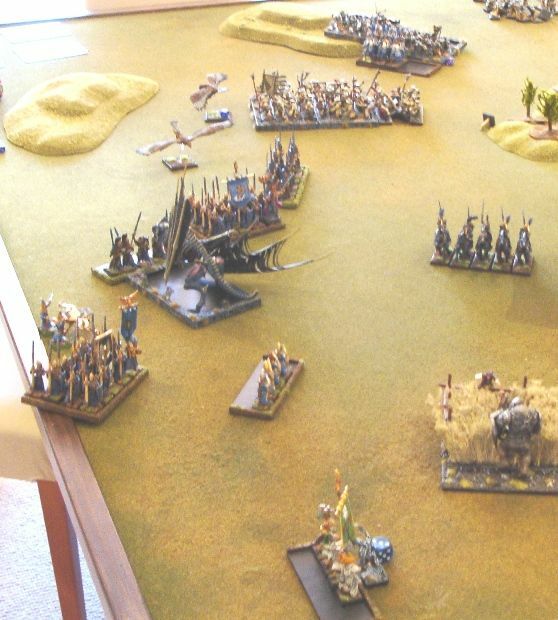 Swordmasters were aided by the sea guard and reavers all charging from the flank. The Archmage enchanted the blades of the warriors of Hoeth and they weakened the monster. Sea guards spears hit hard too. But the last blow was dealt by one of the stallions of the finest ellyrian stock and the terrorgheist was no more. Seeing this Ghould King made a cry of hatred and despair. His plan in tatters and his army turned to dust. He dispatched a few more lions and disengaged leaving a sole survivor proudly holding regimental standard high. Despite the fact it was a friendly game we didn't have infinite amount of time. As we spent a little too long chatting about new HE army book we didn't have time to finish the game. However, at this stage it was clear HE won. Ghoul King would easily kill last lion in the following turn but that would leave him in the open facing all the elven shooters. It was quite possible he would not be able to survive this. 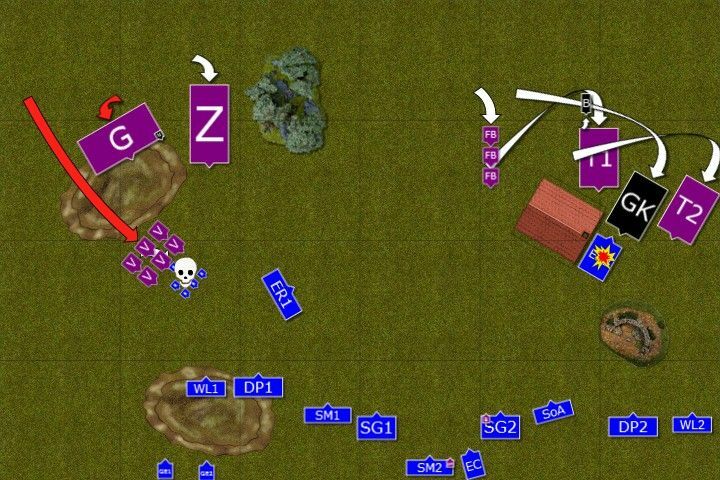 On the right flank ghouls and zombies were in no position to attack and in fact, Swordmasters had a nice way open for a flank attack. With almost no magical defenses elven archmage could cast transmuatation on ghouls and destroy them even quicker. I was very happy with the result as this type of an army is a real trouble for my small units. Terrorgheists, thanks to the fact they can scream into combat, can easily destroy each of my units all by themselves if not wounded. I guess waiting and keeping the distance at the beginning of the game payed off. The fact that helped me was the split between the enemy forces. I could focus on big fliers and form a nice defensive crescent without fear of being flanked. No proximity to the general meant both hordes were really slow in their advance too. With the crucial turn when I managed to dispel both attempts to heal the terrorgheists and then being able to destroy bsb and one of the monsters, I managed to gain upper hand. Maybe deploying hordes centrally and going for one or the other flank with fliers would have been a better idea? There were of course moments where things could have been different. If that terrorgheist didn't fluff its screaming and then attacks and then t-stomp, Swordmasters would have probably fled giving it a nice pursuit path to avoid counter attack. Sure, there was my shooting phase next but Adam would have gained points. The same with that combat with a Ghoul King. Last survivor robbed him from getting more victory points too. So he didn't get some and lost some instead. There was a chance for a draw at least. In terms of my own performance there were a few things I wonder about. First, Shadow Warriors. I was not happy to sacrifice them like that but in the end that allowed me to destroy Vargheists. I lost Lions in the process but I think it was a good exchange anyway. I secured the flank and had cavalry in position to hunt down the necromancer. 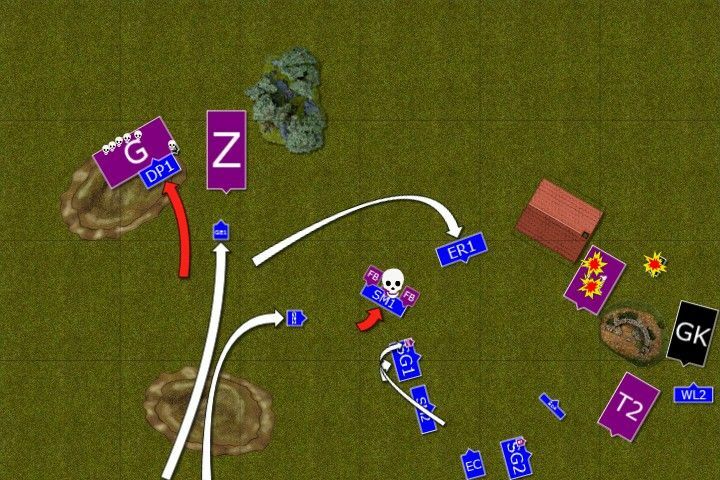 In the end I lost 3 units but killed powerful regiment of the enemy and got one of his characters. Good for me! On the right flank I think I lost reavers in a stupid way. There was no way I would have survived all the screams (and in fact one was all that was required). I also positioned Princes and Lions badly. The charge of one of these units (Lions had flaming attacks) could potentially destroy one of the monsters. In particular heavy cavalry is good at it since they cannot thunderstomp them. 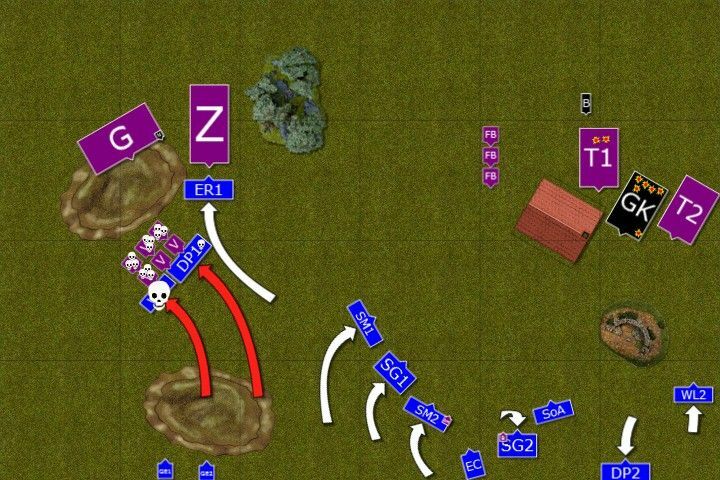 In terms of new rules and units (Shadow Warriors discussed already) it was good to have that S8 reaver bow for one turn (I used it when on of the terrorgheists was destroyed). Sisters didn't have a good target really as 6+ regeneration on terrorgheists is not that big of a problem. While they still wound them on 6+ as everybody else so they could not do much. But they did add to the whole shooting phase. I didn't feel the lack of re-rolls much but I am aware that fighting against the enemy with lower WS is not going to be the situation where I am going to miss that. The metal magic was still good and the main problem I had was rolling well for winds of magic. Not as much to say about this one. Forces that deploy split up rarely seem to beat you. That just plays into MSUs natural advantage of denying reform and minimizing attacks by combined charges. I haven't seen you use shadow warriors often and this wasn't an easy army to use them against. Flyers and especially "screamers" ruin their day. Even the building wouldn't have protected them! So you used them as well as you could have. I had know idea vargheists were that powerful in combat! I was shocked that they completely wiped out the White Lions in one round! I really need to borrow some army books and study up. This is a report I'll continue to study. You did a great job dealing with the monstrous fliers and getting a better understanding of how to deal with that will be an important lesson to learn. Yes, big fliers are a big problem :) They are possible to kill but because they fly they are hard to stop. Interestingly, in some cases unridden monster is more dangerous than the one with a character as it cannot be challenged. So yes, anti-flier tactics it important. In this case the good thing is terrors are possible to kill at a distance. Somehow I cannot do it with phoenixes. But despite possible healing it pays off to shoot at terrors as their scream gets weaker. Vargheists have 4 S5 attacks each and against infantry there are also stomps. So while they are vulnerable they also hit hard. They are one of the priorities to deal with. I am glad I managed to pull out a victory but I know it is never going to be easy!